PE-Xa barrier pipe suitable for use in Underfloor Heating and Wall Hung Radiator systems. Ideal for fitting to castellated panels or direct to insulation the PE-Xa pipe can be easily bent into position and held in place with clips. 16mm x 2mm, 240m, 500m coils. 17mm x 2mm, 240m, 500m, 600m coils. 20mm x 2mm, 500m coils. 25mm x 2.3mm, 500m coils. Constructed of an inner layer of PE-Xa, an adhesive layer and an outer oxygen barrier layer of EVOH. This gives a higher temperature rating than the Alpert multilayer pipe at 95oC and 6 bar. The EVOH layer prevents permeation of oxygen through the tubing which eliminates corrosion of the metal components in a heating system. What is crimp fitting or crimping? There are many different systems on the market. Generally in the UK we use press fittings, which are a form of crimping. Connection is reached by pushing the outer sleeve to pipe, compressing it between the sleeve and the inner brass piece. This is achieved using a mechanical press tool. 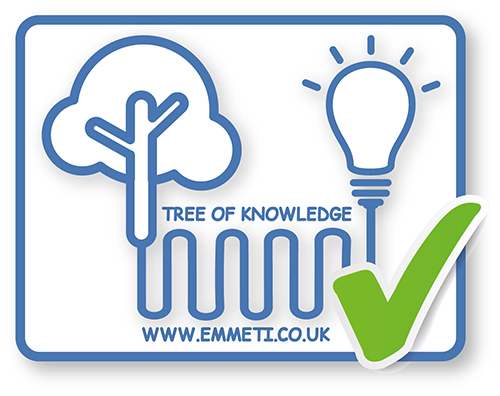 Emmeti offer a range of these, please ask for further information. Can we connect to Wirsbro 20mm PE-X pipe? How do I connect 22mm Hep2O pipe to your 1” manifolds? Please purchase U9240018 22mm x 1” BSP Male copper adaptor. Ensure you follow the pipe manufacturer’s instructions on how to connect to 22mm copper adaptors. Are you able to join pipes under the floor? This is achievable; you must ensure the joint is sealed with a protective tape (permanent adhesive like duct tape) to ensure screed does not seap in to the monoblocco pipe connector, as this will erosion of the seals over time, and perhaps create leaks. However where possible this should be avoided. How do I remove permanent airlocks in line in a pipe that is higher than the existing system air vents? If the pipe is exposed, you can cut into it, and place a tee-piece (code 28103200), with two inline 24x19 monoblocco threads and a 1/2" FBSP connection, facing this upwards (fitted as an inverted tee). Choose monoblocco connectors from our range to match your pipe (take care of the pipe wall thickness). Then screw in a manual air vent 00400004 into the tee. Can underfloor heating pipe be used for radiator central heating? What is the difference between PE-Xa, PE-Xb and PE-Xc? PE-Xa, PE-Xb and PE-Xc are all made of cross linked polyethylene. The a, b and c identify the manufacturing method, a: Peroxide method, b: Silane method and c: Irradiation method. All are suitable for wet UFH applications. PE-Xa tends to be the most flexible, kinks may be repaired with a heat gun but has a lower bursting pressure than PE-Xb. PE-Xb tends to have the greatest resistance to oxidation, highest bursting pressure, although kinks must be cut out. PE-Xc is the most environmentally friendly to manufacture although is the least resistant to kinks. 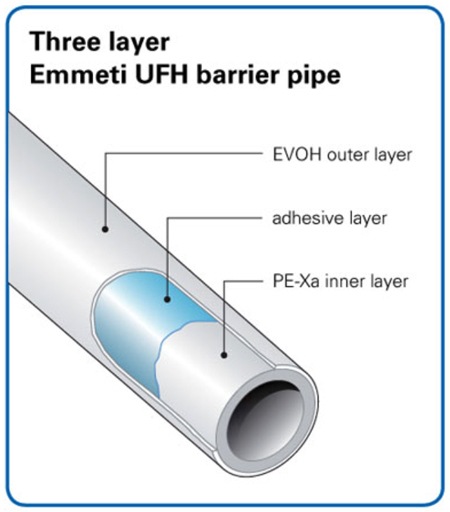 Does Emmeti offer a pipe repair coupling?